• Soften 1 finely chopped onion and 1 crushed garlic clove in olive oil. Add 300g sausage meat, 100ml sliced porcini mushrooms, a splash of white wine and 600g chopped tomatoes. Simmer for 1 hour. Serve with penne. 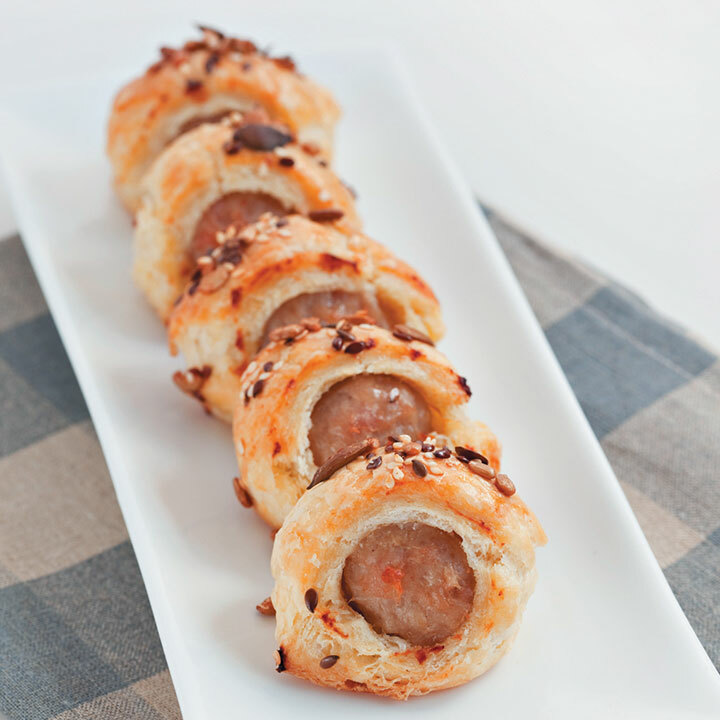 • Make sausage rolls by skinning sausages and rolling each sausage in a piece of puff pastry. Seal with beaten egg and trim any excess pastry. Brush with beaten egg and sprinkle with mixed seeds. Bake at 200°C in a preheated oven until crisp and golden, about 20 minutes. • Soften 30ml (2 tbsp) diced onions, 100g green lentils, 100g yellow lentils and 5ml (1 tsp) pimento in a deep saucepan. Add 1½ litres vegetable stock and reduce. Add 2 diced carrots and 3 potatoes when the lentils are cooked. Season and stir in 4 sliced chorizo sausages. • For toad-in-the-hole, whisk 2 large eggs, 15ml (1 tbsp) mustard, 125g cake flour, 150ml milk and 150ml water. Leave to rest for 15 minutes. Skin 6 pork sausages and wrap each sausage in streaky bacon. Add a glug of oil to a roasting tin and heat the tin. Pour in the batter, then arrange the sausages in the batter. Bake until golden, about 30 minutes, and serve with gravy. • Combine 1 chopped onion, 2 crushed garlic cloves, 450g sausage meat, 15ml (1 tbsp) chopped fresh flat-leaf parsley, 30ml (2 tbsp) chopped fresh sage, 50ml fresh white breadcrumbs and salt and freshly ground black pepper, to taste. Roll the mixture into balls and oven bake for 30 minutes at 180°C in a preheated oven. Serve with poultry.